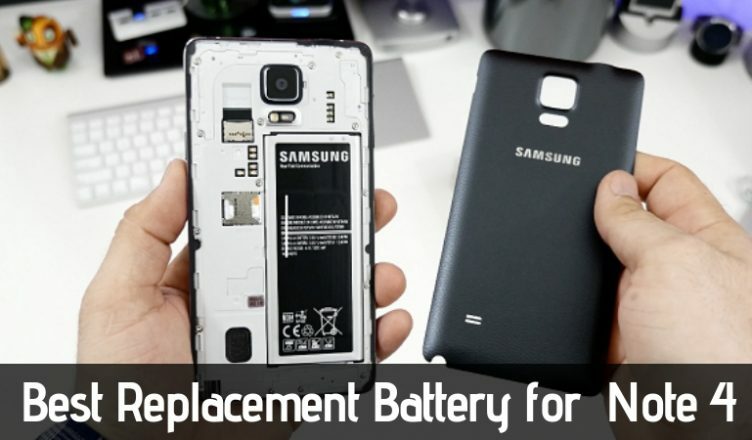 If your Samsung Mobile’s battery is not working well even after charging or you can not charge it at all, then it’s the time to buy a replacement battery for it.In 2014, Samsung launched the first Galaxy Note 4 Android device. Since then, the different variants of this series has gained quite strong popularity among the smartphone users worldwide. Still today, the Note 4 models are the preferred choice for the mobile buyers to enjoy the Full HD videos, social media, playing games, surfing web, etc. But, as with every high-spec smartphone device has, Samsung Note 4 also has a common issue of battery life. Over time, the battery degrades, and you need to replace it. Thankfully, there are quite a few good replacement batteries are available that you can use on your Galaxy Note 4. We will have a look at them today. 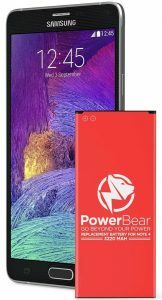 The PowerBear Note 4 replacement battery is compatible with all the Samsung Galaxy Note 4 models as well as other mobile phones brands like AT & T, Virgin, Sprint, T-Mobile, and Verizon. It is a perfect replacement for your smartphone’s old battery and keeps your phone on for a long time. This Li-Ion battery has a capacity of 3220mAh with a certified Grade A+ battery cells. It delivers up to 400 hours of charging and can be loaded entirely in only two hours. It is compatible with the Galaxy Note 4, N910, N910V, N910A, N910U, N910P, and N910T models. The inbuilt failproof IC tracks the temperature of the device and delivers input accordingly to protect your Android phone. You will get a 24-months warranty from the company. 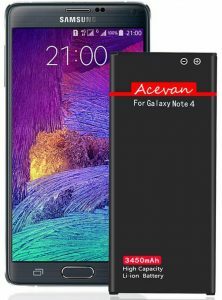 The Acevan high capacity replacement battery for Galaxy Note 4 offers efficiency and longevity. This officially tested Grade A+ battery will perfectly fit in the slot without making you adjust the back cover of your phone. It has a slightly high capacity of 3540mAh compared to other standard batteries in its category. The built-in microchip will prevent the over-charging, over-heating, over-discharging, and short-circuiting of your phone. Thus, it also will help to extend the battery life. It is compatible with the smartphone models like Samsung Note 4 N910, At & T N910A, T-Mobile N910T, N910F, N910U LTE, Verizon N910V, etc. This battery is certified by CE and RoHS standards for a high-speed charging and efficient power backup. Along with the battery, you will get a micro USB charging cable and one user manual with instructions. This rechargeable battery from Samsung can be used as an official replacement of the degraded battery of your Galaxy Note 4. Now, forget keeping the power bank with you all the time when you are using your smartphone. This genuine product will keep your device on for longer times and let you enjoy the stuff on the screen without worrying about power. It has a capacity of 3220mAh with highly rated battery cells. It is compatible with all the models of Galaxy Note 4. As this is an official product, there is no doubt of the quality and working of it in Android devices. It comes with a clear plastic protective case to prevent any damage to the battery during transport or while not in use. An affordable yet recommended battery replacement from RAVPower is a powerful unit. It matches all the standards of the OEM batteries for Samsung devices. Though it is not officially announced that it has an inbuilt microchip for preventing the issues of overheating and overcharging, but the warranty of 30 months from the company offers a worry-free purchase to the users. This battery has a capacity of 3220mAh which provides enough power to keep your phone on for long hours. It can be charged in a quick time and can go to 0% to 100% in just a couple of hours. The OEM standard approved battery provides 48 hours of standby performance which is quite impressive for the high-end smartphones. It is compatible with many smartphone models like Note 4 N910, N9100, N910U 4G LTE, N910H, SM-N910P (Sprint), SM-910A (AT&T), SM-N910T (T-Mobile), SM-9108W, SM-N9109W, SM-910F, SM-910FQ, etc. The premium grade A+ cells delivers over 500 times of charging cycles with optimal performance. 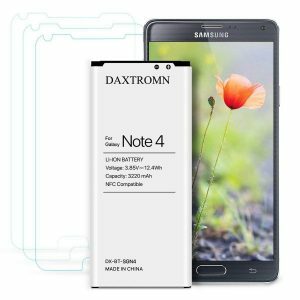 This DAXTROMN unit is an efficient replacement for the expired or non-working battery of Samsung Note 4 Android mobiles. As it is NFC compatible, you can connect it wirelessly with the compatible devices for sharing the data. This battery comes with a power capacity of 3220mAh with a 3.85V power. It is compatible with almost all the major wireless carriers including Note 4 N910, N910U 4G LTE, N910T (T-Mobile), N910P (Sprint), N910A (AT&T), etc. It is certified by the CE, FCC, and RoHS standards with an inbuilt microchip for protecting over-heating, over-charging, and short-circuit for safer operation on your Android mobiles. If your battery drains quickly or you have to recharge your Note 4 phone multiple times in a day, then this battery is the perfect replacement for it. The company provides a 30-day money back guarantee and a 2-year warranty for this product. 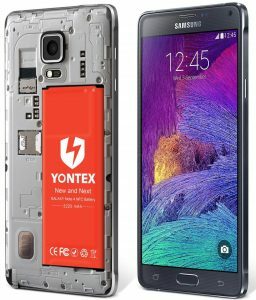 With the compatibility to various models of Note 4 series, the YONTEX replacement battery is a good option for powering up your Android mobile. The inbuilt NFC antenna will help you to connect it with the NFC devices and make payments easily through the apps like Google Pay, Samsung Pay, etc. The 3220mAh battery provides enough power for the Samsung Note 4 models and keeps them on for long durations. It is compatible with all the major carriers including Note 4 IV, N910U 4G LTE, N910, Verizon N910V, T-Mobile N910T, Sprint N910P, etc. It has similar specifications like the original Samsung battery in the Note 4 mobile which makes it a perfect replacement for it. The inbuilt chip with the FCC, CE, and RoHS standards protects the device from the overcharging and overheating issues. It also helps to increase battery life. You will get a 24-month warranty from the company. 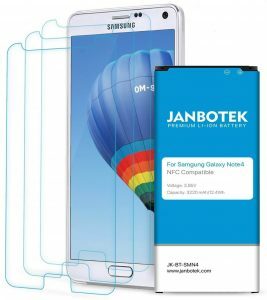 The Li-Ion replacement battery from JANBOTEK is an affordable option for the Samsung Note 4 users. It supports all the variants of the Galaxy Note 4 which makes it quite popular among the worldwide users. It has a 3220mAh power capacity with premium grade A+ cells. It is compatible with the RoHS, CE, and FCC standards which means your phone will get efficient charging output and protection against electrical damage. This battery provides support to most of the carriers like Samsung Galaxy Note 4 N910, N9100, N910U 4G LTE, N910H, Verizon SM-910V, Sprint SM-N910P, AT&T SM-N910A, etc. In this package, you will also get a screen protector to protect your mobile screen from the scratches, dust, and other small damaging factors. The company provides a 24-month warranty on this battery. There is no doubt in that the Samsung Galaxy Note 4 is an excellent device for a few years now. It is a preferable choice for the new mobile buyers as well as for those who are replacing their old smartphones. Due to its high specs and intuitive smartphone features, it requires a strong battery replacement when the original one degrades or having some issues. All the products mentioned in the list here are tested recommended by the experts. So, you can choose your suitable replacement battery for the Galaxy Note 4 according to your choice and budget.